Trump has been roundly criticized in the last few days for not condemning in the strongest possible terms the violence the occurred over the weekend in Charlottesville, Virginia. White supremacists and Neo-Nazi groups collided with counter protesters in the streets of Charlotteville, leaving thirty-two-year-old Heather Hayer dead after a man slammed his car into a crowd of protestors at the Unite the Right rally. “I love our country and our company and will continue to focus my efforts on inspiring every person that they can do anything through the power of sport which promotes unity, diversity and inclusion. 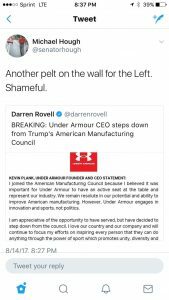 Republican Maryland state Sen. Michel Hough, who represents District 4 in the Maryland Senate, released a tweet last night that was critical of Plank’s decision to leave Trump’s manufacturing council. As first reported by the Frederick County Fact Check, Hough’s tweet was quickly deleted. 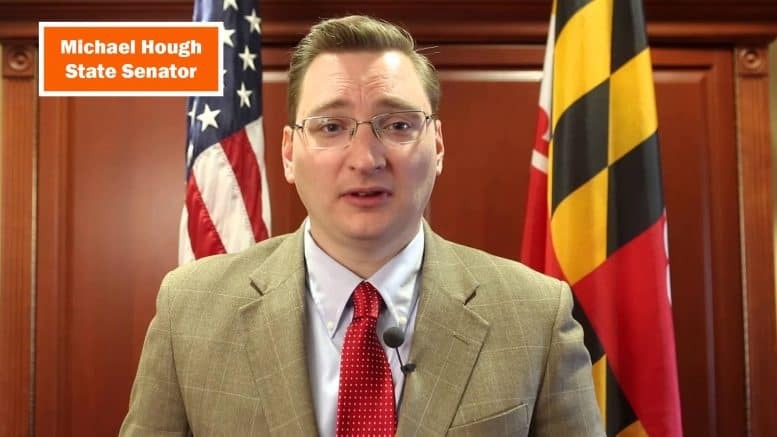 Hough later posted to the Frederick County Fact Check’s Facebook page that he stands by his original tweet but did not want to engage in negativity and social media fighting. Hough recently took a job as chief of staff to West Virginia Rep. Alex X. Mooney, another loyal defender of President Trump. Hough’s wife, Joeylynn, the former Frederick County Republican Central Committee chair, was an elected Trump delegate to the Republican National Convention in 2016. In a June 2016 Washington Post article, Mrs. Hough was highly critical of Maryland Gov. Larry Hogan for not supporting then-candidate Trump. Joeylynn Hough, a delegate to the national convention from Brunswick, said although it’s ultimately the governor’s personal choice, many think Hogan should respect the support that Maryland GOP voters have shown for the presumptive Republican nominee. Trump won 54 percent of the vote in the state’s Republican primary in April. “They feel betrayed by him,” Hough said. “They feel he should put his differences aside and needs to respect their decision. Please continue to follow AMinerDetail.com for the latest Western Maryland news.